coloring book that provides an opportunity for you to mentally step away from the busyness of life in order to color, pray, doodle, reflect, and journal. At the same time, you get to focus on a Bible verse that will help you rediscover the goodness and faithfulness of God, no matter what you are facing. I love this idea! 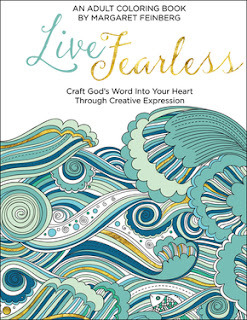 There are 20 verses, with 20 coloring pages, and 20 journaling pages that can all be used to help you reflect on God's Word and deepen your faith in Him. Then, you can also encourage others by taking a photo of a finished page and posting it on social media sites with the hashtag #livefree. The only thing I think the book could use is maybe some more pages. For a peek of the inside, check it out here on AMAZON.com. NOTE: I received a free copy of this book from the publisher, and I have shared my own opinion.